Roskilde festival is a landmark in the Danish culture and as new comer in this society I looked so much forward to experience this microcosm by myself. 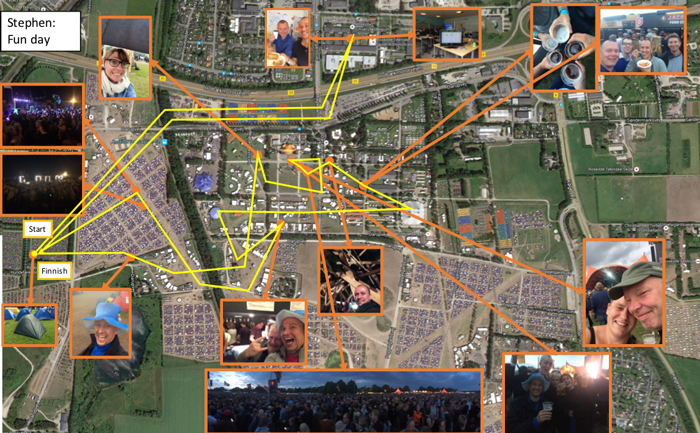 With the Geolocation data from the Roskilde Festival app I could document my experience et share it with you. I started my day at mu tent and went to work at the BigData Lab. Around 15:30 I went with my colleagues listen to Edward Snowden at Rising. 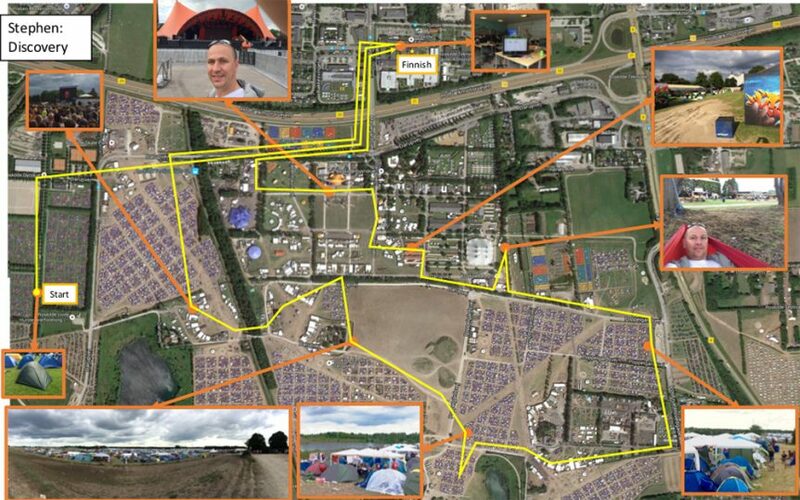 After I decided to explore the camps and find out what is Roskilde experience. I crossed the bridge to listen to a concert at Appolo, continue towards dreamland and the unique view over this camp. I investigated the lake and the temperature of the water. Too cold…. I stopped by the Kvickly to observe the average time between transaction for our lab. With my observation and data I headed back slowly to the lab wondering in Easy city. Stopping by the Arena park to enjoy their Hammock bed. My last experience was the festival area where artist were putting the final touch to their painting in the village. My day started as many people with work. I biked from my tent to the lab. I was so fast that only 2 points were register by the app. At 19:00 my colleague and I decided to close the day and enjoy the festival. I went back to my tent to change and left the bike there because I always end up walking back with my friends at the end of the night. So let’s be free and leave the bike behind ;-). In the mean time I received a message from a friend that I have not seen for 2 years. She was at the festival and I had a chance to meet here. So wearing my special hat I head toward Escho under a heavy rain. It was so nice to catch up with her. But now it was time to listen to Neil Young at the orange scene and meet my colleagues. I could not join my colleagues in the pit and had to listen from a distance the concert. But I meant many people. A young gang that offered me a beer because of my hat. A volunteer that I worked with and her husband that leaves with the festival. A piss drunk volunteer bus driver off duties and her friend. Finally, I met under the wood gate of the Orange scene to a mum of 3 kids that always comes to Roskilde to have her time off once a year. I really enjoy talking to them. I believe that is the spirit of Roskilde. My colleague joined me after the concert and we were off for food hunting at the food court and some beers. On the the way to our tent we stop for a last concert at Apollo and a juicy burger. On the way bacj we could not resist to stop by the parties to close the night.